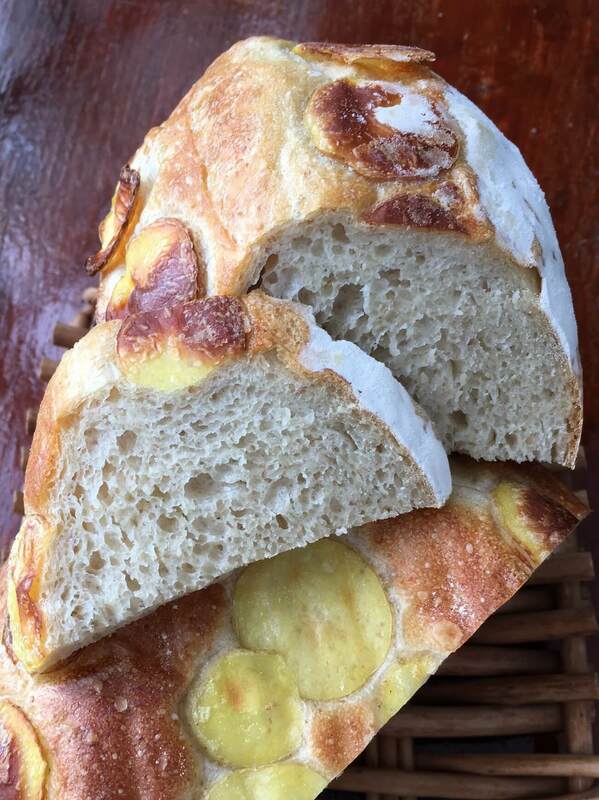 This Potato Bread for Rustic Sandwiches is designed for slices of home cooked roast beef. It is both chewy and light with a subtle flavor from rye flour. The slices of potatoes on the outside give the bread, and any sandwich made on it, a built-in side dish. I’ve been trying to recapture the flavors of a mythic roast beef sandwich for many years* and finally found the bread on which to make it. 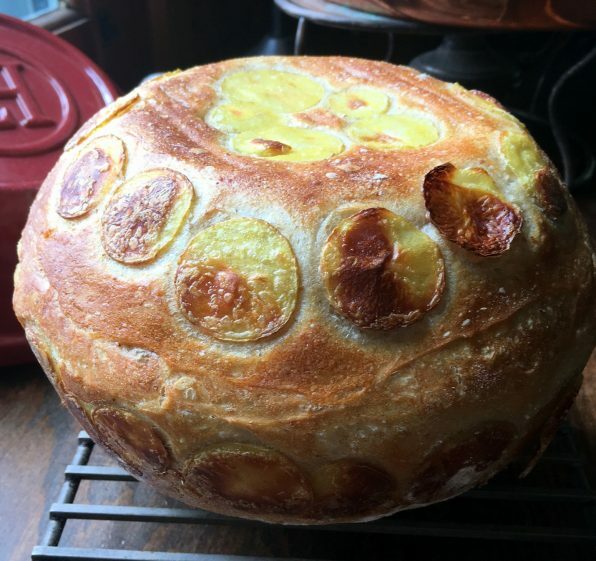 When my friends at Emile Henry asked me to make bread in their covered Potato Baker, naturally I thought it would have to be a bread with spuds. When we make potato bread dough to bake in a standard loaf pan, we use freshly made mashed potatoes. They flavor the dough and give it a squishy, slightly damp texture. But mixing the dough requires some experience. If your mashed potatoes are too wet, you need to add more flour. I wanted something easier to manage and more foolproof. Instant mashed potatoes seemed right but the brand I used gave the bread an unpleasant overcooked taste and stale smell. So I tabled the project for several months. Something I read recently reminded me to try potato flour, made from ground dried whole potatoes. (I’ve used it successfully in gluten free baking.) And it did the trick. Starchy potato flour absorbs a good deal of water contributing to the moistness I associate with potato bread. It also tenderizes and softens the dough so I use bread flour in this dough to give it structure. Using a sponge and adding rye flour to any bread dough adds a flavor dimension and a speck of color, a favorite trick I use here. You can knead this dough by hand or in a mixer fitted with a dough hook. (Or in your food processor for that matter.) As you can see in the photo, the bread has a somewhat coarse cell structure. If I’d kneaded the dough more thoroughly, the gluten structure would have been more developed and the bread would have had a finer grained crumb. Although absolutely optional, the sliced potato garnish is a show stopper. And it’s very simple to make. First, slice firm baby new potatoes with a hand-held mandolin then blanch the slices in boiling water for a few minutes. This step ensures that the potatoes won’t blacken while baking. I brush the slices lightly with oil then lay them in slightly overlapping in rings on top of the dough before proofing. This way the slices have time to stick to the dough’s surface before it bakes. Baking the dough in the Emile Henry Potato baker or a covered pot gives the loaf a uniformly crunchy and browned crust without the fuss of adding water to the oven. I adjusted the quantity of dough so that it fills the pot completely. But this dough can be formed into a round loaf and baked directly on a heated baking stone or on a parchment-paper lined baking sheet. 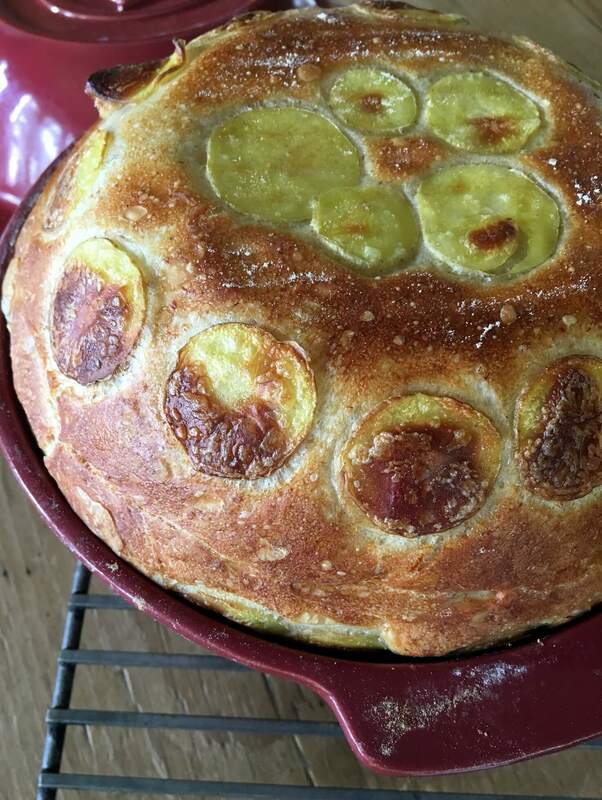 Or it can be baked in a large loaf pan. In either case, you will need to generously flour your work surface when forming the sticky dough into a round or loaf. Grease your loaf pan well to keep the dough from sticking. I ate the best roast beef sandwich in my life in the summer of 1976 in Chatham, Massachusetts. Two slices of homemade white bread lathered with cool butter and layered with thickly sliced fresh roast beef, salt and pepper. It was as plain as the homey lunch spot with the creaking screen door where we got it. 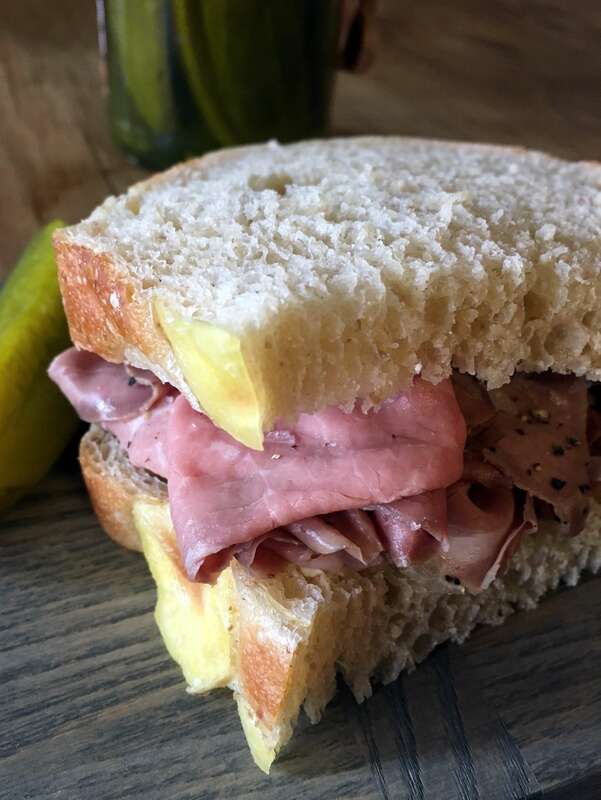 Wrapped in waxed paper, the sandwich was something your mythical grandma would make the day after a roast beef dinner. We had made the 4 hour drive to the Christopher Ryder House in Chatham to see Peter Kapetan, my dear friend from high school, perform. (Uncle Rene played there too.) He took us to lunch at a nearby spot, a favorite with the actors for the taste and perhaps the price, under $3 as I recall. We ate the sandwiches on the weathered porch of the place, standing up under an overcast sky, the kind of day that signals end-of-summer for New Englanders. Peter told us about the woman who ran the place and with whom he shared his rich laugh and a few kind words. The Christopher Ryder House closed in the 1983, dinner theater and the Opera House décor a bit passé in the age of disco. And dear Peter died too young nearly ten years ago. But there are signs that the bakery might still be there. I’d wager it was either Marions’s Pie Shop or the Chatham Bakery where we got those sandwiches, which were “to die for” Peter said, the first time I heard that expression too. Notes for a road trip. To make the sponge, combine the potato flour, all-purpose flour, warm water, rye flour and yeast in a deep bowl. Stir with a spatula or sturdy whisk to combine. Cover and set aside for one hour. It will bubble up actively. To make the dough, scrape the sponge into the bowl of a mixer fitted with the dough hook. Add the bread flour and salt. Knead on low speed until the flour is moistened. Scrape the bowl and increase the speed to medium. Knead the dough until it is smooth and elastic for 5 more minutes. It will be quite moist and somewhat sticky. Using moistened hands, gather the dough into a ball. Scoop it into a plastic container. Cover and allow the dough to ferment and rise for 1 ½ to 2 hours. While the dough ferments, make the potato garnish. Cut the peeled potatoes into paper-thin slices using a mandolin or sharp knife. Put the slices into a bowl of cold water. Blanch the potato slices in boiling salted water for 2 minutes, just until they are flexible and softened. Drain the slices of cooked potato in a strainer then place them in a single layer on paper towels to dry. Form the dough into a smooth ball. Sprinkle the inside of the Emile Henry Potato Baker with flour. Place the dough into the pot. Lightly brush each slice of potato with oil. 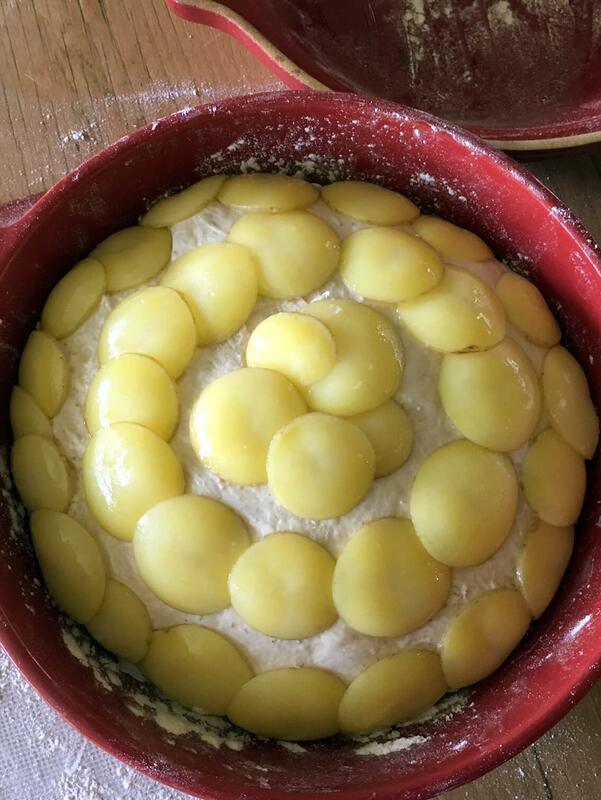 Lay the slices of the potato on top of the dough overlapping in a decorative pattern. Cover and let the dough proof until it fills the bowl and is visibly risen, for approximately 30 to 40 minutes. Uncover the pot. Using a serrated knife or baker’s lame, slash the exposed surface of the dough horizontally in several places. Replace the cover. Bake for 45 to 50 minutes until the dough is golden brown, fully risen and crisp. Remove the lid and bake for 5 additional minutes to darken the top crust. Cool the bread completely on a wire rack before slicing.